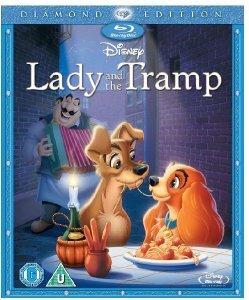 Make a date with Lady and the Tramp as Disney's 15th animated masterpiece is available once more on Disney DVD and for the first time ever on high definition Disney Digital Blu-ray™ from 30th January 2012. This new year, rediscover one of the most romantic tales ever told, as Lady, a lovingly pampered cocker spaniel meets Tramp, a mutt from across the tracks with a heart of gold. Lady's life is thrown into chaos when Aunt Sarah moves in with her devious felines, Si and Am, to baby-sit, the very protective Lady soon finds herself being fitted for the unthinkable -- a muzzle! In her bid for freedom, she meets and is charmed by Tramp, dog-about-town. Together with friends Jock, Trusty, and Peg, they share a thrilling adventure on an enchanting evening as Lady learns what it means to be footloose and leash-free. Available just in time for Valentine's Day, Lady and the Tramp tells the romantic 'tail' of dogs from different worlds whose love triumphs against the odds. This exquisite animation also comes chocked full of exclusive new bonus features such as "Diane Disney Miller: Remembering Dad", deleted scenes and much more! For fans of Disney animal classics, keep an eye out for the Animal Magic extravaganza where titles like Robin Hood, Bambi, Bolt, Winnie the Pooh, Brother Bear, The Aristocats and many more animaltastic titlesare all looking for a new home! Running Time: 73 minutes approx.